Join us for the Premier Email Industry Awards Event! We’re excited to share that the Sparky Awards are back for a second year! We’re celebrating exceptional email API development and email marketing efforts by recognizing outstanding work in several categories. Because they’re designed to coincide with the Oscars and official award season, the Sparky Awards run from January 23, 2017 through February 24th. We will announce the three winners back here on the blog on or about March 6, 2017. So, know a developer, company, or email pro who deserves recognition and can’t wait a minute longer? Nominate them or your own project! 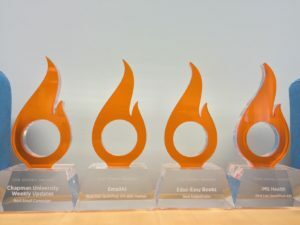 The Sparky Awards recognize and celebrate the creativity and skill of those leveraging email to scale their business. Anyone can enter, from large companies, start-ups, email managers, or developers – we’re celebrating email professionals and developers on all points of the spectrum. We also realize you have a choice in email service providers and platforms, which is why you don’t need to be a SparkPost customer to enter or win — with the exception of the Best Use of the SparkPost API – which you can quickly setup an account to be eligible for. In order to be considered, simply fill out the nomination form. Select which award you’re nominating yourself (or someone else!) for, then provide any supporting context, examples and documentation. Once submissions close, our panel of judges will deliberate and determine winners for each category, then vote on a grand prize winner. Be sure to include all relevant contact information so we can get ahold of you if we need additional info, or if you’re a winner! Once determined, the winner from each category will receive a coveted Sparky Award trophy engraved with their name and bragging rights for a year. In addition, one grand prize winner will receive a ticket to an email or industry conference of their choice – up to $1000. Terms and conditions apply. Questions about The 2017 Sparky Awards? Tweet us, or leave a comment down below. Good luck! Do you already have a winner in mind? Submit to win a Sparky! You can see who took home the 2016 Sparky Award honors here.